12/13/2007-- Public Law. This measure has not been amended since it was introduced. The summary of that version is repeated here. Fair Treatment for Experienced Pilots Act - Amends federal transportation law to allow a pilot who has attained 60 years of age to serve as a passenger airline pilot until the age of 65, provided that a pilot who has attained age 60 may serve as pilot-in-command on international flights only if there is another pilot in the flight crew who has not yet attained 60 years of age. Prohibits subjecting pilots to different medical examinations and standards on account of age unless to ensure an adequate level of safety in flight, except that no person who has attained 60 years of age may serve as a pilot unless such person has a first-class medical certificate. Requires air carriers to: (1) continue to provide FAA-approved training to pilots, with specific emphasis on initial and recurring training and qualification of pilots who have attained 60 years of age; and (2) evaluate, every six months, the performance of pilots who have attained 60 years of age through a line check of such pilot. Requires the Comptroller General to report to Congress on the effect of the modification of pilot age requirements, if any, on aviation safety. This Act may be cited as the `Fair Treatment for Experienced Pilots Act'. SEC. 2. AGE STANDARDS FOR PILOTS. (a) In General- Subject to the limitation in subsection (c), a pilot may serve in multicrew covered operations until attaining 65 years of age. (b) Covered Operations Defined- In this section, the term `covered operations' means operations under part 121 of title 14, Code of Federal Regulations. (1) APPLICABILITY OF ICAO STANDARD- A pilot who has attained 60 years of age may serve as pilot-in-command in covered operations between the United States and another country only if there is another pilot in the flight deck crew who has not yet attained 60 years of age. (2) SUNSET OF LIMITATION- Paragraph (1) shall cease to be effective on such date as the Convention on International Civil Aviation provides that a pilot who has attained 60 years of age may serve as pilot-in-command in international commercial operations without regard to whether there is another pilot in the flight deck crew who has not attained age 60. (B) such person is newly hired by an air carrier as a pilot on or after such date of enactment without credit for prior seniority or prior longevity for benefits or other terms related to length of service prior to the date of rehire under any labor agreement or employment policies of the air carrier. (2) PROTECTION FOR COMPLIANCE- An action taken in conformance with this section, taken in conformance with a regulation issued to carry out this section, or taken prior to the date of enactment of this section in conformance with section 121.383(c) of title 14, Code of Federal Regulations (as in effect before such date of enactment), may not serve as a basis for liability or relief in a proceeding, brought under any employment law or regulation, before any court or agency of the United States or of any State or locality. (f) Amendments to Labor Agreements and Benefit Plans- Any amendment to a labor agreement or benefit plan of an air carrier that is required to conform with the requirements of this section or a regulation issued to carry out this section, and is applicable to pilots represented for collective bargaining, shall be made by agreement of the air carrier and the designated bargaining representative of the pilots of the air carrier. (1) MEDICAL EXAMINATIONS AND STANDARDS- Except as provided by paragraph (2), a person serving as a pilot for an air carrier engaged in covered operations shall not be subject to different medical standards, or different, greater, or more frequent medical examinations, on account of age unless the Secretary determines (based on data received or studies published after the date of enactment of this section) that different medical standards, or different, greater, or more frequent medical examinations, are needed to ensure an adequate level of safety in flight. (2) DURATION OF FIRST-CLASS MEDICAL CERTIFICATE- No person who has attained 60 years of age may serve as a pilot of an air carrier engaged in covered operations unless the person has a first-class medical certificate. Such a certificate shall expire on the last day of the 6-month period following the date of examination shown on the certificate. (1) TRAINING- Each air carrier engaged in covered operations shall continue to use pilot training and qualification programs approved by the Federal Aviation Administration, with specific emphasis on initial and recurrent training and qualification of pilots who have attained 60 years of age, to ensure continued acceptable levels of pilot skill and judgment. (2) LINE EVALUATIONS- Not later than 6 months after the date of enactment of this section, and every 6 months thereafter, an air carrier engaged in covered operations shall evaluate the performance of each pilot of the air carrier who has attained 60 years of age through a line check of such pilot. Notwithstanding the preceding sentence, an air carrier shall not be required to conduct for a 6-month period a line check under this paragraph of a pilot serving as second-in-command if the pilot has undergone a regularly scheduled simulator evaluation during that period. (3) GAO REPORT- Not later than 24 months after the date of enactment of this section, the Comptroller General shall submit to the Committee on Transportation and Infrastructure of the House of Representatives and the Committee on Commerce, Science, and Transportation of the Senate a report concerning the effect, if any, on aviation safety of the modification to pilot age standards made by subsection (a).'. This document contains information relating to the Fair Treatment of Experienced Pilots Act (the Act) that was signed into law by the President on December 13, 2007. That Act is recorded as Public Law 110-135, and became effective immediately. The Act is self-explanatory and clear in most respects, but it raises some questions. In an effort to promote uniform understanding of the Act, and uniform implementation of its provisions, the FAA is consolidating in this document questions and answers relating to safety issues, as those questions are received and resolved. The date of the current revision is shown at the top of each page, and is updated each time this document is revised with new or amended content. Your question will be acknowledged and answered as quickly as possible. Please do not address questions to the FAA regarding § 44729(e) or § 44729(f) of the Act. Those subparagraphs concern issues beyond the scope of the FAA’s safety mission. • As of 12/13/07, part 121, § 121.383(c), specifying age 60, ceases to be effective. • A pilot age 60+ acting as pilot in command (PIC) in international operations must be paired with a pilot under age 60 (consistent with the current ICAO requirement). • In domestic operations both pilots may be age 60+. 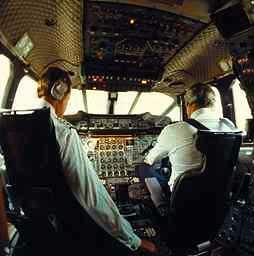 • It permits the continued employment of a pilot who reaches age 60 on or after 12/13/07. • It permits the employment as a new-hire a pilot who reached age 60 before 12/13/07. • A pilot age 60+ will not be subjected to different, greater, or more frequent medical exams. • Any pilot age 60+ must hold a first-class medical certificate, renewable on a 6-month cycle. • Any air carrier employing pilots age 60+ must adjust its training program to ensure such pilots’ skill and judgment continue at acceptable levels. • Any pilot age 60+ must undergo a line check at 6-month intervals. • For a pilot age 60+ acting as second in command (SIC), a regularly scheduled simulator evaluation may substitute for a required line check. Question #1: During international operations, must a pilot younger than age 60 be on the flight deck at all times when a PIC over age 60 is on the flight deck? Answer: No. A pilot younger than age 60 does not have to be on the flight deck at all times when a PIC over age 60 is on the flight deck. When there is an augmented flight deck crew assigned to a flight, that assigned flight deck crew must include one pilot who is licensed, current, qualified, appropriately rated for all phases of flight, and younger than age 60. Under Title 49 of the United States Code (49 U.S.C. ), § 44729(c)(1), a pilot who has attained 60 years of age may serve as a PIC for part 121 operations between the United States and another country only if there is another pilot assigned to the flight deck crew who has not yet attained 60 years of age. This section reflects Congress’s intent to follow the recommend International Civil Aviation Organization (ICAO) standard for international operations. The minimum requirement for international operations, however, is that a flight may not depart unless the flight deck crew includes one pilot who is licensed, current, qualified, appropriately rated for all phases of flight, and younger than age 60. Question #2: A part 121 flight departs from a point in the United States, transits international airspace, and then lands at a point in the United States without making an intermediary stop. Under US code (Title 49) if the PIC is over age 60 does one member of the assigned flight deck crew have to be under age 60? Answer: No. In accordance with the Fair Treatment of Experienced Pilots Act, now codified at 49 USC Section 44729 (also known as the age 65 law), all pilots could be over age 60 as long as they had not attained age 65. For example, for a flight from the continental US to Alaska, Hawaii, Puerto Rico, the US Virgin Islands, or Guam, the US code would not require a pilot under the age of 60. Question #3: What is the deadline for an SIC’s first line check under the Act? Answer: June 13, 2008. An SIC age 60+ is required to have a line check (or a regularly scheduled simulator evaluation) within six months after enactment of the Act (enacted 12/13/07), and every six months thereafter. Question #4: Is there a grace period associated with the six-month checks? Answer: No. A public law trumps FAA regulations, and, unlike FAA regulations, the Act makes no provision for a grace month in respect to the six-month checks required of pilots age 60+. Therefore, a six-month check could be conducted earlier, but not later, than six months since the previous check. Question #5: Is the six-month cycle computed on calendar months? or nominal 30-day months? or nominal 31-day months? Question #6: What is a regularly scheduled simulator evaluation under the Act? Answer: A regularly scheduled simulator evaluation is any training or checking session in a simulator regularly occurring as part of an air carrier’s approved training program for pilots. Examples include initial, transition, upgrade, requalification and recurrent checks conducted under Part 121 Appendix F; training in lieu of a check permitted by 121.409; recurrent LOFT as permitted by 121.409; or an LOE, a maneuvers validation, or a simulator training event regularly occurring under the Advanced Qualification Program (AQP). Question #7: Does participation in AQP permit flexibility of the scheduling of the six-month checks required by the Act? Answer: No. The Act stipulates that a line check (or, for SICs, a regularly scheduled simulator evaluation) be conducted within six months of enactment (12/13/07) and every six months thereafter. There is no special provision for participants in AQP. Question #8: When a pilot turns 60, in the future, does he need a line check right away or six months after he turned 60? Answer: The pilot would need a line check (or, for an SIC, a regularly scheduled simulator evaluation) within six months of his or her last line check (or regularly scheduled simulator evaluation, as applicable). The concern of Congress in drafting The Fair Treatment for Experienced Pilots Act (the Act) was to address critics' concerns that pilots' performance might deteriorate after age 60. Accordingly, Congress specified health checks and performance checks at six-month intervals for any pilot over age 60. Under the provisions of this section, when do first-class medical certificates expire for pilots over the age of 60? Question #10: Does this provision change how expiration of a first-class medical certificate is calculated for pilots over age 60? Answer: No. The expiration date of a First Class medical certificate for a pilot over age 60 is calculated in the same way as the expiration date of a First Class medical certificate for a pilot under age 60. Question #11: Currently, 14 CFR Section 61.77(e) prohibits a person who holds a special purpose pilot authorization from serving as a pilot in certain international air services and air transportation operations if the pilot has reached the age of 60. Since the passage of the Fair Treatment for Experienced Pilots Act, may the holder of a special purpose pilot authorization serve as a pilot on a civil airplane of U.S. registry until the age of 65? Answer: Yes. Pilots holding a special purpose pilot authorization are not explicitly addressed by the new law. However, the FAA finds no basis in safety for prohibiting them from flying until age 65 and believes that Congress intended that they be permitted to do so in drafting the Fair Treatment for Experienced Pilots Act. The intent of Congress was to bring the United States into conformity with the standard ratified by the member states of ICAO (International Civil Aviation Organization) and adopted in November of 2007. Accordingly, the FAA interprets the law permissively in this respect, and is currently amending its own regulations to reflect that interpretation.